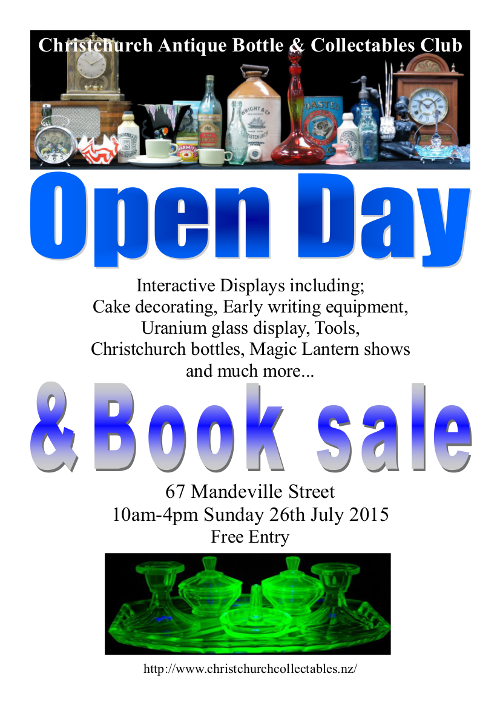 Christchurch Antique Bottle and Collectables Club | A place for collectors of anything old and interesting! Early club newsletters or magazines are being scanned and added to the members only area of this website. So far we have added the very first one from Sept 1976 as well as April 1977, April 1978, April and Sept 1979 and June 1980. This year’s final Club meeting/barbecue will be at the Philatelic Centre, 67 Mandeville Street, this Sunday 29 November, commencing 6.00 p.m. Instead of themed Bottles or Collectables this month, you are invited to bring a Mystery Object. Door charge is $3 per person, and there will be a $1 raffle as usual. Members with a last name beginning A - M are asked to bring a salad, while those with a last name beginning N - Z are requested to bring a dessert. Please supply your own cutlery, plates, cups and liquid refreshments. The Club will provide barbecued meats. Usually only a small proportion of a museum's collection is on display at any one time, but soon people from around he world will have access to more than 100,000 items from the Toitu Otago Settlers Museum. Read the article from the Otago Daily Times "Museum collection going online", by Craig Borley (Sat, 5 Sep 2015). The What's Happening page has been updated, including the Harbour Bazaar (Lyttelton), Seaside Market (New Brighton), Linwood Rotary Market (Linwood Avenue School), Historic Oamaru Victorian celebrations, Akaroa Antique Fair (Area School) and the Members Bus trip (go here). The next Club meeting will be on Sunday 25 October at the Philatelic Centre, 67 Mandeville Street, and will begin promptly at 7.00 p.m. The item of the night will be sports collectables, and the bottle(s) of the night will be 1960 bottles. There will also be new finds. Members are asked to bring no more than two items in this category. Articles for future club magazines are always welcome. Please send these to Hugh via the contact page of this website. The Christchurch City Library is an excellent source of information about the history of Christchurch, e.g. early Christchurch, foundations, famous men, women, buildings and places, local history fact files and provides many other links to historical data on Christchurch. The next Club meeting will be on Sunday 27 September at the Philatelic Centre, 67 Mandeville Street, and will start promptly at 7.00 p.m. The item of the night will be high tea collectables, and the bottle(s) of the night will be cream and milk bottles. There will also be new finds. Members are asked to bring no more than two items in this category. The next Club meeting will be on Sunday 26 July at the Philatelic Centre, 67 Mandeville Street, and will start promptly at 7.00 pm. This will again be labeled a Special General Meeting, when further proposed amendments to the Club Rules (as a result of input from Club members) will be tabled. A copy of the proposed rules has been emailed to members. New amendments are in blue type. 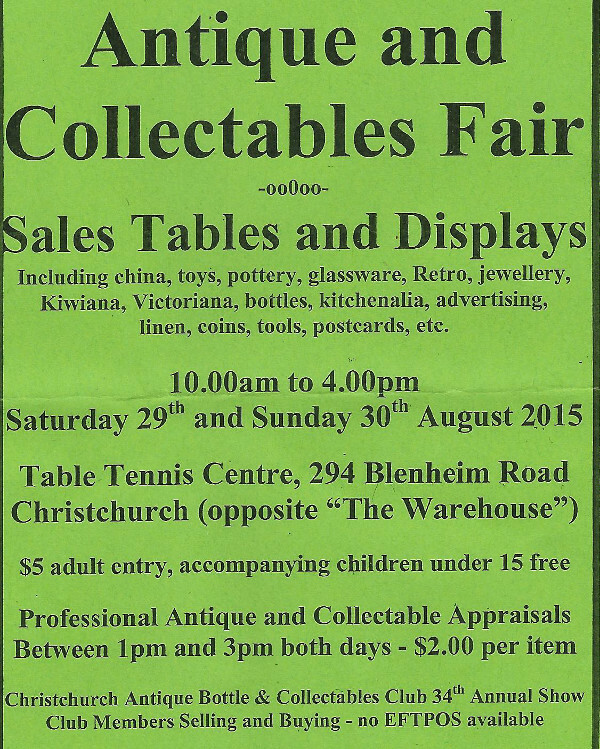 For a number of months http://christchurchcollectables.nz/ has been a valid address for this website. We are retiring the address christchurchcollectables.org.nz. All that's changing is that we're dropping the "org" part. From 2 September 2015, the old address will no longer be valid as the domain registration will expire. Please update bookmarks to the new address. If you get lost, google us! As notified at last month’s meeting, the next Club meeting on Sunday 28 June at 7.00 p.m. at the Philatelic Centre, 67 Mandeville Street, is also a Special General Meeting at which the proposed rule amendments will be circulated. The Collectable and Bottle of the Night will be farming related, and there will also be New Finds. The next Club meeting is also the Annual General Meeting, to be held this Sunday 31 May 2015, commencing 7.00 p.m. at the Philatelic Centre, 67 Mandeville Street. The meeting will be followed by New Finds and a light supper will be served. A reminder about the Northbrook lunch on 20th of June. The cost is $27 per head and payment should be made at Sunday’s meeting. A Club magazine will be distributed on Sunday. Articles for future Club magazines are welcome at any time. Please send these to Hugh via the contact page on this site. This is to advise that the next Club meeting is at the Philatelic Centre, 67 Mandeville Street, this Sunday 26 April, commencing 7.00 p.m. 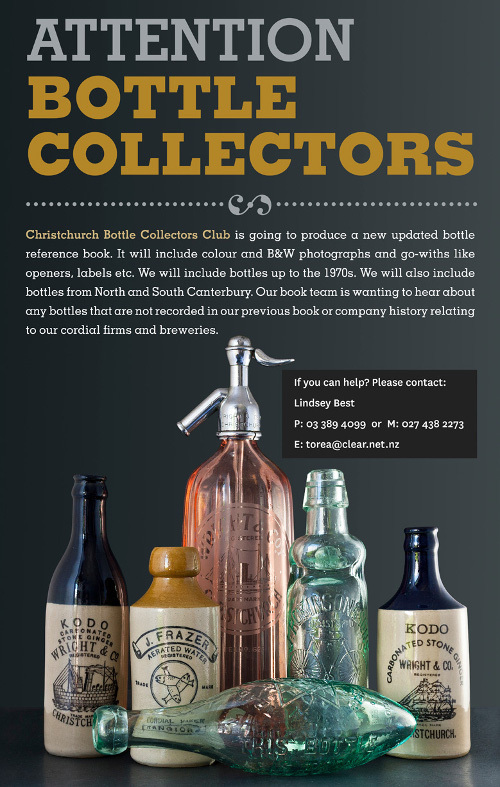 The Collectable theme this month is ANZAC related, and the Bottle theme is Unrecorded Christchurch bottles. There will also be New Finds as usual. Door charge is $3 per person. A Raffle will be available at $1 per ticket. A reminder that Sales tables are free, and there is a separate table for individual items that members may wish to sell. This is to advise that the next Club meeting is at the Philatelic Centre, 67 Mandeville Street, this Sunday 29 March, commencing 7.00 p.m. The Collectable theme this month is Vehicle-related tools and garage accessories, and the Bottle theme is Vehicle-related. There will also be New Finds as usual. The next Club Meeting is at the Philatelic Centre, 67 Mandeville Street, this Sunday 22 February, commencing 7.00 p.m. The Collectable theme this month is Fishing, and the Bottle theme is bottle ‘bloopers’. There will also be New Finds as usual. Door charge is $3 per person. A Raffle will be available at $1 per ticket. A reminder that Sales tables are free, and there will be a separate table for individual items that members may wish to sell. Poster art exhibition at Canterbury Museum "Selling the Dream" shows tourism posters that helped promote New Zealand, both locally and to the world. The exhibition features more than 50 lithographs and silk-screen prints produced by some of New Zealand’s leading commercial artists between the 1920s and 1960s. The first Club Meeting for 2015 will be held at the Philatelic Centre, 67 Mandeville Street, this Sunday 25 January, commencing 7.00 p.m. The Collectable theme this month is Laundry and the Bottle theme is cleaning agents. There will also be New Finds as usual. Door charge is $3 per person. A Raffle will be available at $1 per ticket. A reminder that Sales tables are now free, and there will be a separate table for individual items that members may wish to sell.